For whatever reason, the Yankees quickly decided Brackman would not live up to his potential, but the organization’s hopes for Betances are still very high. And some might argue that because of his unique size, it behooves the Yankees to be extra patient. After all, 6′ 10″ Randy Johnson didn’t find his true form until he was 26, so maybe it just takes tall pitchers longer to develop? That line of reasoning seems to make sense, but, unfortunately, the Big Unit is more an exception than the rule. Note: Based on pitchers since 1901 listed at 6’7″ or taller and with at least 500 career innings. Since 1901, only 110 pitchers have been listed at 6′ 7″ or taller (an inch was shaved off Betances’ height to increase the sample and account for some of the discrepancies in historical records), and of that total, only 35 pitched more than 500 innings. 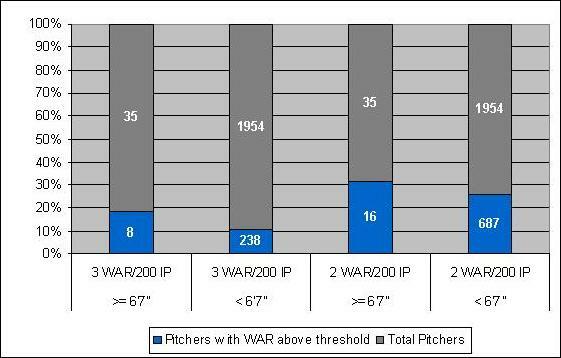 What’s more, only eight from the group averaged more than 3 WAR per 200 innings and a mere six compiled a career WAR greater than 20. In other words, it’s hard enough for a particularly tall pitcher just to make it to the big leagues, not to mention stick around for a long and successful career. So, should the Yankees send Betances packing in a deal before his extraordinary height catches up with him? Well, not quite. Although it is true that taller pitchers are a rarity, their rate of success is impossible to determine with knowing how many have tried and failed to make the majors. Who knows, if not for the NBA, baseball could be overflowing with pitchers who cast a shadow all the way to the batter’s box? Regardless, what we can determine is the comparative rate of success between pitchers who are at least 6’7″ and those who are shorter. Note: Includes all pitchers since 1901 with at least 500 career innings. Although taller pitchers reach the 500 innings plateau at a slighter lesser rate than their shorter counterparts, once they reach that lofty level, bigger does mean better. 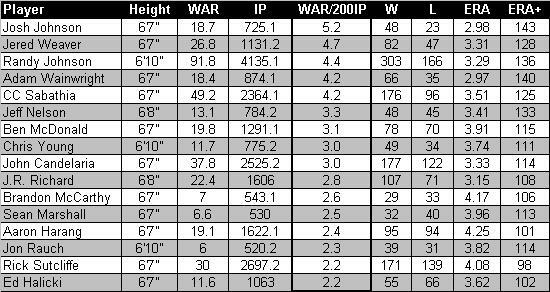 Over 45% of taller pitchers averaged at least 2 WAR per 200 innings and over 22% averaged at least 3 WAR per 200 innings, compared to 35% and 12%, respectively, for hurlers who measure less than 6’7″. So, if Betances doesn’t have a long and successful career, it probably won’t be because he’s too tall. Before concluding, it’s interesting to note that while tall pitchers are rare, position players who measure at least 6’7″ are practically unheard of. In the modern era, almost 7,500 major leaguers have played at least five games at a position other than pitcher, and of that total only nine have been 6’7″ or taller (all played at least some first base). Luckily, Betances decided to take up pitching when he was a kid. Note: Richie Sexson is widely listed as being 6′ 8″, but B-R.com lists him at 6′ 6″.